A sparkling diamond solitaire, crafted in lustrous 18ct white gold with diamonds down the shoulders and a secret diamond inside the band. The Forever Diamond has a unique cut made up of 73 facets for exceptional sparkle and radiance and is independently certified by IGI for colour, clarity, carat and cut. 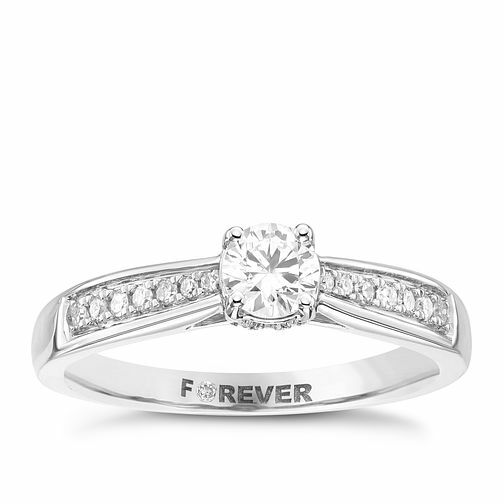 18ct White Gold 2/5 Carat Forever Diamond Ring is rated 4.4 out of 5 by 8. Rated 5 out of 5 by Anonymous from Beautiful ring Just purchased a Forever Diamond ring and it's stunning.